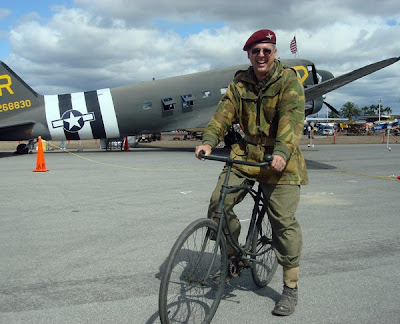 In honor of Independence Day, here are two stories about bicyclists who helped to defend our country's freedom. Both stories come to us courtesy of the Adventure Cycling Association. The first is the story of the 25th Infantry Bicycle Corps, an all-black regiment in the segregated 19th-century US Army. 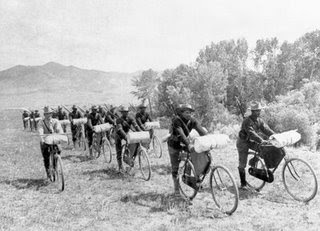 Based in Ft. Missoula, Montana, the regiment traveled by bicycle from there to St. Louis, Missouri, a total of 1,900 miles in 41 days during 1897. The purpose of the trip was to experiment to see whether the bicycle could serve a useful purpose in the Army. Fast forward to World War II for the next story. A folding military bike was used by some of the British paratroopers deployed in the D-Day invasion on the coast of Normandy on June 6, 1944. Shown here is a re-enactor on a replica model. You can read more details here. This last story is not bicycle-related, but I thought it was cool. Take one high school class project, a disappointing grade, and a couple dozen calls and letters to the White House. What you get is the story behind our current 50-star flag came to be. Listen to online at NPR's StoryCorps.